It's a new month, which means we're delving into the collection of a brand-new Magpie of the Month! Because Princess Eugenie of York is getting married in a few days, we're spending October with one of her royal namesakes: Empress Eugenie of France. And we're kicking things off with an absolutely grand brooch from her collection: the Currant Leaf Brooch that later belonged to New York's Metropolitan Opera. The brooch was made in 1855 by Bapst. 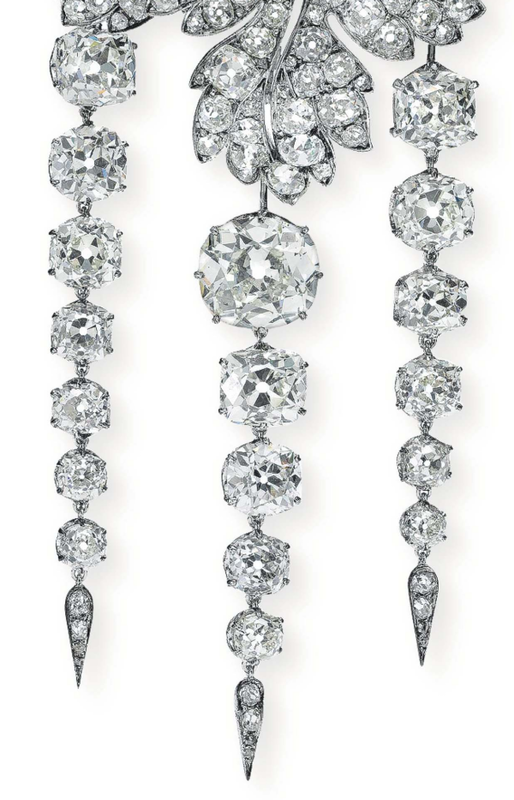 In the notes from a 2014 auction of the piece at Christie's, it is described as being "designed as a cluster of three openwork currant leaves set throughout with old mine diamonds, centering upon a larger cushion-shaped-mine diamond and suspending three detachable articulated pampilles, each composed of graduated old mine diamond collets to the drop-shaped aiguillette terminals, mounted in silver and gold." It's hard to believe, given the size and design of the brooch, that it was actually once part of a much larger piece of jewelry -- but it was. 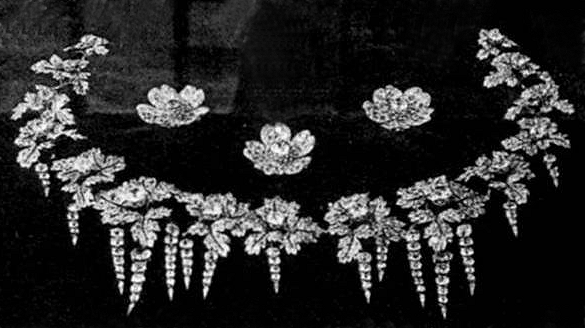 In 1855, Bapst created a demi-parure of diamond jewels for Empress Eugenie which featured currant leaves in the design of each piece. (The name of the suite, "Feuilles de Groseillier," simply means "currant leaves" in French.) The set included a garland (or necklace), a tour de corsage (a long ornament that stretched across the wearer's bodice), and a devant de corsage (a large brooch worn on the front of a gown's bodice, like a stomacher). 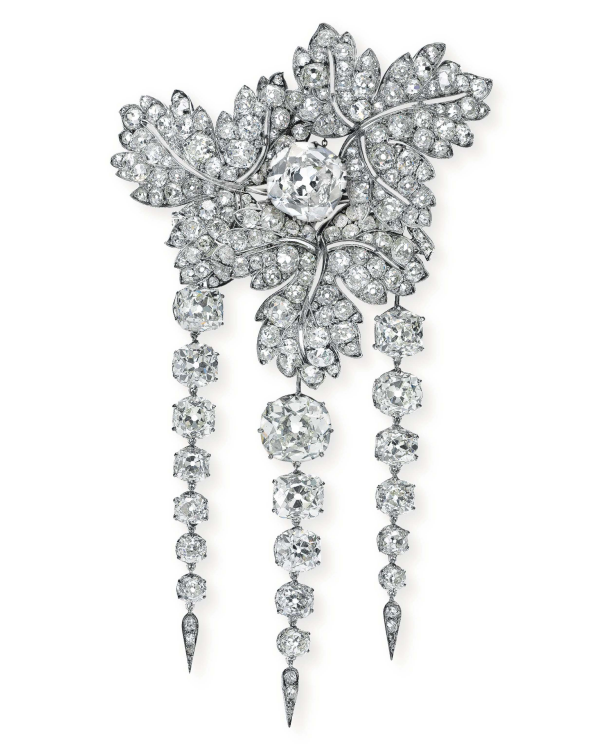 The brooch was part of the large garland-style necklace, which is pictured above with a separate trio of rose brooches that were not part of the currant leaf suite. You can see how the garland would eventually be broken down into individual brooches, with fringes suspended from some of the sections. Today's brooch is one of the sections that has three individual fringes. ...and here's a good close-up of the piece's fringes, or pampilles. 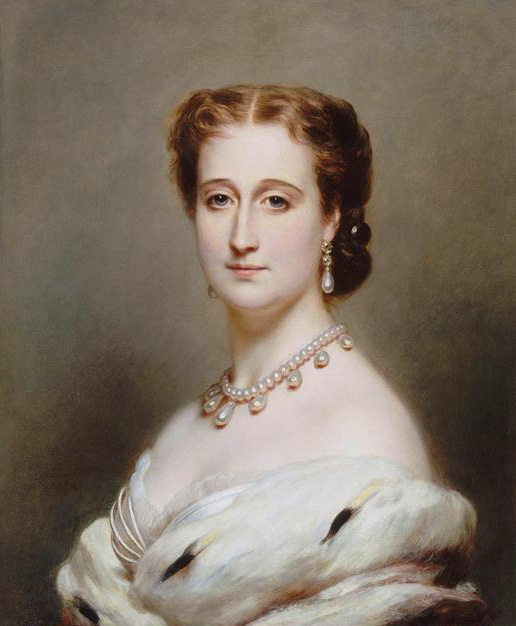 Unfortunately, we don't seem to have any extant images, either paintings or photographs, of Empress Eugenie wearing this grand suite of diamond jewels. It would have been astounding to see all of the pieces worn together, but it wasn't to be. 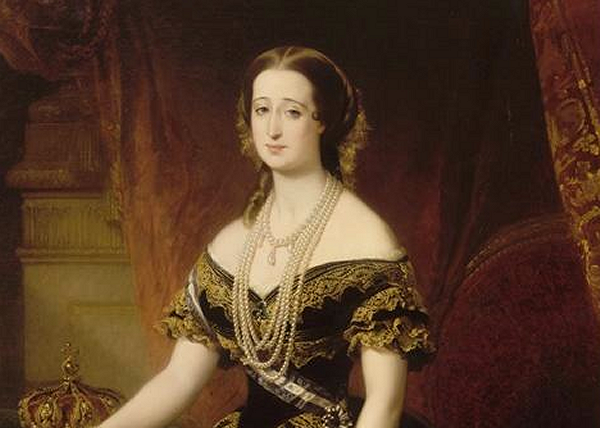 Eugenie's husband, Emperor Napoleon III, was overthrown in 1871, and she spent the rest of her life in exile. The currant leaf demi-parure stayed behind in France. Sixteen years later, the jewels went into a kind of exile of their own. When the French government decided to sell the nation's crown jewels in May 1887, the suite was among the glittering lots offered at auction. The enormous garland necklace was broken down into eight separate sections, including today's brooch. It was purchased at the auction by the jewelry firm Tiffany and Co.
From Tiffany's purchase of the brooch in 1887 until the late 1930s, the brooch's journey gets a bit murky. It resurfaces again in New York in March 1936, during the retirement gala for Lucrezia Bori, a remarkable Spanish lyric soprano who appeared in more than 600 performances with the city's Metropolitan Opera. She was also a tireless, extremely effective fundraiser for the Met, especially during the Great Depression. 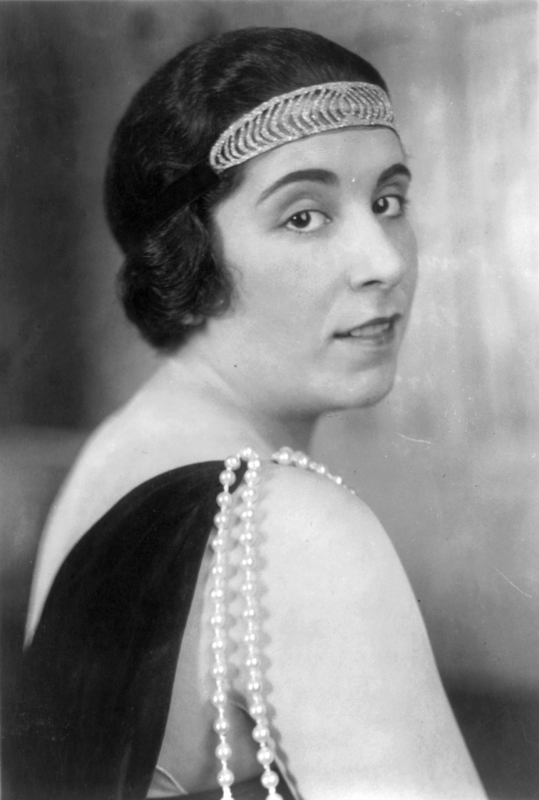 At the gala, in recognition of both her talent and her charitable efforts, Helen Huntington Astor presented Bori with the Currant Leaf Brooch on behalf of the Metropolitan Opera Board. Bori kept the brooch for the rest of her life, and when she died in 1960, she bequeathed it back to the Met. And, until 2014, that's where it stayed. 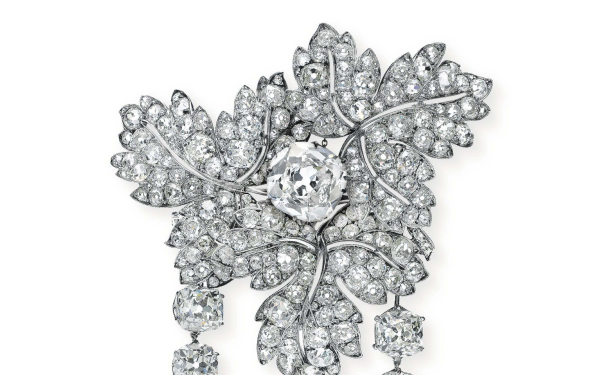 But facing more financial hardship -- and perhaps lacking a fundraiser as effective as Bori -- the Metropolitan Opera decided to sell the brooch at auction, selecting Christie's in Geneva to do the honors. 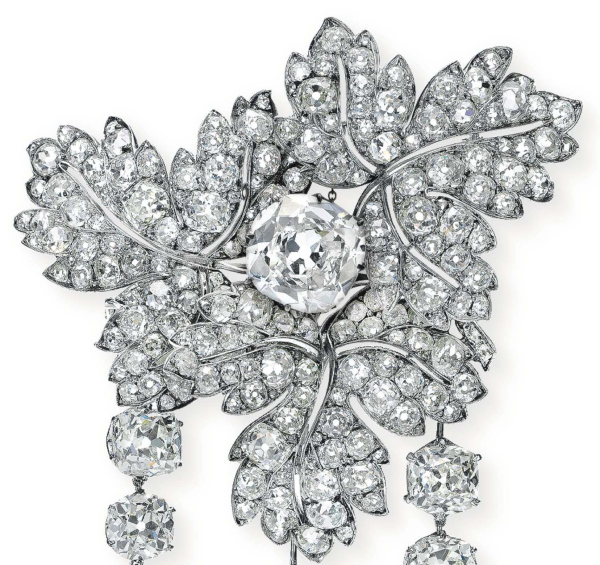 The auction estimate was appropriately high, and when the hammer fell, the brooch had fetched the equivalent of more than $2.3 million USD.